Steam is bringing American cuisine to Wilmington using locally sourced goods & ingredients. With an extensive wine & beer selection, plenty of cocktails, indoor/outdoor seating, & beautiful views of the Cape Fear River, Steam is your new go-to restaurant. Enjoy $3 Bloody Marys and Mimosas all day Saturday and Sunday!! Join us for our Mother's Day Brunch Buffet Extravaganza from 11-3pm!! Selections are vast including, Salad station, Cured Salmon, Oysters on the Half Shell, Made to Order Omelet Bar, Swordfish, Home fries, Golden Beets, Gouda Grits, and Biscuits and Gravy. And Out of this world House Made Desserts! Join us for Easter Brunch 11am-5pm. Extensive plated Brunch Menu features dishes such as Millennial Toast, Wilma Bennie, Prime Rib, and Shrimp and Grits. We also have great craft cocktail features from the bar including our Signature Blood Orange Mimosa!! Reserve your table today! First time dining at Steam and will definitely be going back! You need to think about installing shades that actually block the sun in the early evening. Also the glare of the sun off the river is quite annoying. Not to impressed. Seafood selection was not exciting. The food options were great! I appreciate a smaller menu because it leads me to believe they have perfected their craft in the items on the menu. The shrimp and grits were excellent and everyone at the table cleaned their plate! The mimosas were also delicious. We also had an amazing view of the river and a great breeze on the patio. Dinner before a fabulous concert. It was close by venue and very good. Was slightly concerned before dining that a restaurant in hotel might be iffy. Totally surprised, nice dining experience. Tasty cocktail, the Alchemist, super appetizer, crispy Brussels sprouts, and two fine entrees. Quick and attentive service too. All around fine time. This was our second time there; glad we went back! The Caesar salad was the best I have had, and the chowder was excellent. The salmon was beautifully prepared and delicious, the perfect size; the sides were lovely. The steak frites was cooked perfectly (both steak and fries!). The service was excellent, noise level subdued but engaging, the scenery (had there been no clouds!) was perfect. Go! My girlfriend had the ribeye steak and it was amazing, except most of the steak was just fat. I had the steamy noodles and I’m struggling to get the taste out of my mouth. The service was the best I’ve ever had. My girlfriend said her meal was better than the meal she had at the Ritz Carlton in Cancun. I asked the waiter about our wine he said he'd bring it right over. The meat was ordered rare and it was. It was also cold like it had been cooked well in advance and they forgot to warm it up. Potatoes were also cold. Bread never arrived nor did anyone to refill our water. My sister reminded me that hotels only know how to rent rooms and run bars. They don't know how to run restaurants because they don't have to. She was so right. Disappointed. Fish was salty, clans too big and tough. My guest and I really enjoyed this restaurant, and it was especially convenient being located in the Embassy Suites hotel. The food was fantastic. I had the Steak Frites. The meat was cooked perfectly. Overall, we had a very enjoyable experience. This was our first visit to Steam, before a play at the Wilson Center. We were very pleased and will be back. Outstanding view of the Cape Fear as well as great food, reasonable prices, great service. We Ubered to Steam at Embassy Suites and it was very walkable to the Center for those that choose to use this option. Got a great sunset as well! Everyone there was exceptional! The young man who greeted us was so nice and our waitress was outstanding. It was quiet and very clean. The food was delicious and the portions were perfect. I would recommend this restaurant to anyone (and already have!). Overall, I'd say our experience at Steam Restaurant was mediocre. The food was okay, but not worth the price in my opinion. When we got there, we were immediately seated, but it took over 10 minutes before anyone waited on us. Not sure if this was just an off night for them, but I doubt we give them another shot anytime soon. Atmosphere was beautiful! Service was slow but once we got our drinks and food it was a delcious meal. The Cape Cobb salad was definitely a win. Ribeye was not cooked to order. We will go back in the summer once the roof top bar is open. Wish they had more of an appetizer selection. Outstanding evening. Two couples were attending a 7:30pm theater show at Wilson Center. We told Matt, our waiter for the evening. Both couples ordered the "theater" menu (choice of shrimp, scallops or short ribs) and a drink. The soup/salads were brought at the same time, followed by all four entrees. Delicious, hot and excellent food presentation. Since the designated dessert was sold out, we were offerd a choice of two other house desserts. Wow. So good and such attention to our time. We will be back! This restaurant was located with a fantastic view of the Cape Fear River. A sunset over the river is spectacular. That being said, the food was very good. We had the scallops, which were exceptional, the salmon, the crab soup, & the sea bass. Everyone thought the seafood options were great. Would definitely recommend. Fantastic experience! The staff made my party feel special and were attentive to our needs/wants. We are in the Engine Room, which is a private dining room at Steam. The room is excellent for larger groups! Food, drink, ambiance, location and staff were all wonderful! This restaurant is phenomenal! My husband and I along with 2 other couples dined here on New Year’s Eve and will most certainly going back again and again. The restaurant had a nice upscale atmosphere with floor to ceiling windows overlooking the river (although the sun had already set so we didn’t get to enjoy the view). Something that surprised us was how large the portions were! Each couple ordered their fries app but could quite honestly have shared the whole thing among all of us. We enjoyed similar large portions with perfectly cooked steaks for some and the best crab cakes I’ve ever had. This restaurant is also on the save30 store so we were able to get our $100 meal for $70! Good waiter. Good service. Great view.easy parking and best of all located in Wilmington, nc. Very poor quality food. Believe the soup was canned. Ridiculous portions; eg, shrimp entree had 3 shrimp. Overpriced. Would never return. I am so sorry about your experience at Steam Restaurant and Bar. I would love the opportunity to speak with you personally. Please call Nicole Boudrieau at 910-726-9226. We would like to make it up to you! Beautiful evening, low light inside the restaurant allowed the evening sunset to be appreciated.... floor to ceiling windows, it was quiet, calm and our table was perfect. We were seated immediately. Kris was our server. He was great. Helpful, informative, and genuine. Food was excellent. Fries w/duck fat, oysters, crab chowder to start. Salmon was cooked perfectly and the crab cakes were delicious w/grilled fennel/greens(l really loved the bitter greens!). Pricey, yes....but worth it for a special night. The menu is very eclectic and we didn't know a lot of the ingredients. The taste of the food was great but the service was terrible. The waiter paid us minimal attention, never refilled our water bottle and was very slow in taking our order. She seemed more interested in other diners and we spent an inordinate amount of time waiting for service. Steam has a pleasant atmosphere for dining and the food once delivered was good. With so many choices for dinner, we're not sure whether or not we will return. This was a great first time. It was easy to find too. I Love the view and the food was really great. I spent my birthday really special and i would would go there again for my next birthday. The service was also good and fast. The surroundings were nice and quiet. Dinner went downhill. Two steak frites came out room temperature. The crab cake tasted fishy and the fourth meal was vegetables which were tasty and served hot. The waitress did a nice job. Some desserts were offered as goodwill and they were very good. I am going to return to try it again. Visited for dinner soon after hurricane Florence, was trying to get back to normal. It was a bit eery being downtown, still a lot of recovery crews around- so I think some of that was affecting my experience. Enjoyed a delicious cocktail, biscuits and pimento cheese and the special of scallops. Main course was my favorite and delicious. Not very crowded on a Friday night but mostly due to when I was visiting. Been here several times and like that the menu options change somewhat. Overall food was good, some options were better. Crab and corn chowder was barely warm and seriously lacking that nice crab flavor. Appetizer of broccoli had right amount of spice heat but had to be sent back initially because it was not hot. Clam appetizer every time has been awesome. Entrees of Shrimp Scampi, Salmon, and Steak Frites was really good. Server was very attentive. Wine list here is great with good selections to choose from. Great food, service, and atmosphere. Will dine there again. Dined on a Friday night. Service and soups were good. Cobia was over cooked and was cold. Went with family members for dinner. Everyone enjoyed their dinner and atmosphere was really nice. Nice setting on the Cape Fear River. Food was good, nothing over the top. My husband had a burger, I had the linguine with scampi and the shrimps were fresh and cooked well, as was the pasta, not overcooked. Our friends were happy with their meal as well. Our server was very pleasant and professional. the Roof Bar, Cloud 9, was nice as well. It's a good place to go too especially for a hotel. Came here with out of town guests. Quiet, comfortable seating with a spectacular view. 3 of 4 entrees were excellent. Service was slow and apologetic. We celebrated a birthday at Steam earlier this week, and had a fantastic time. Service was outstanding, and we so enjoyed the food and the view. Definitely recommend. We had a wonderful anniversary dinner. Clas ere delicious and the broth was very tasty. Hadn't seen my brother and his wife in a year and we had a fabulous time, meal and server!! My wife's 50th...I mean 29th...birthday. Not immediately/clearly pointed out, but the receptionist at the front desk directed us to an elevator that took us to the second floor. Our reservations were for 6pm on a Sunday, but only about 2-3 other tables seated in a very spacious dining room. Our table was by the window with a beautiful view of the Cape Fear River, nicely set and clean. Our server Ryan showed up, very nice young man, knowledgeable of the menu, eager to "check with the chef" on my wife's gluten/dairy restrictions, and he took our drink orders ($10 glass of Malbec and a $7 12oz glass of Allagash White). Our beverage choices came out quickly, Ryan explained the specials and we chose our entrees. 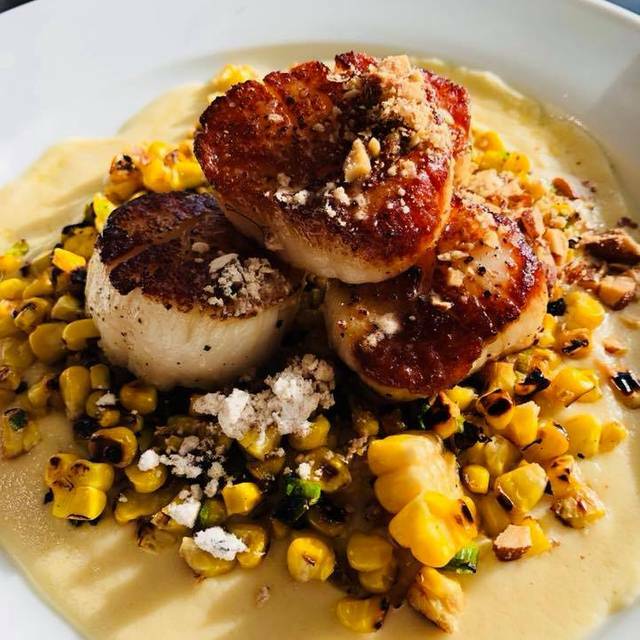 My wife ordered the "Cast Iron Diver Scallops" ($30) which were plated with charred sweet corn, bacon dust and smoked almonds, all on a bed of duck fat cauliflower soubise. 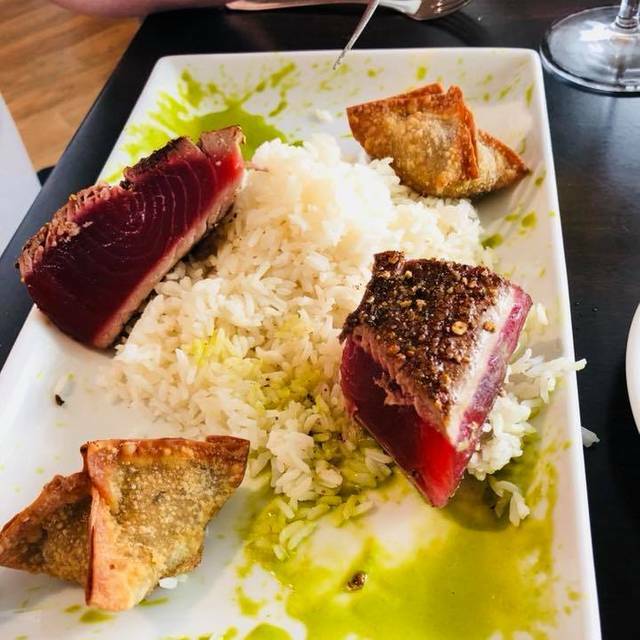 I chose the "Pink Peppercorn Crusted Tuna" ($27) served on a bed of steamed jasmine rice and topped with "Japanese Goddess" dressing (a.k.a. light wasabi influenced puree...perfect amount of heat). Our instructions were to not overcook the scallops, and just a quick "pssst, pssst" on each side of the tuna...I like it raw! We ordered the "Oven Roasted Head of Cauliflower" ($10) appetizer, topped with an herb puree, toasted walnuts, parmesan (on the side...no dairy for the wifey) and citrus zest. The appetizer came out as a generous portion and was delicious. The entrees came out timely enough, and presentation was fabulous. I guess you could say that my wife is a scallops snob, and she was not disappointed. Same goes with me and tuna...gotta be fresh, properly seasoned or bathed, and pink yet warm in the center...they got that right too (maybe forego the heap of unseasoned rice and pair it with roasted potatoes or grilled asparagus instead). A little on the pricey side, but one of our top choices for a special occasion meal.